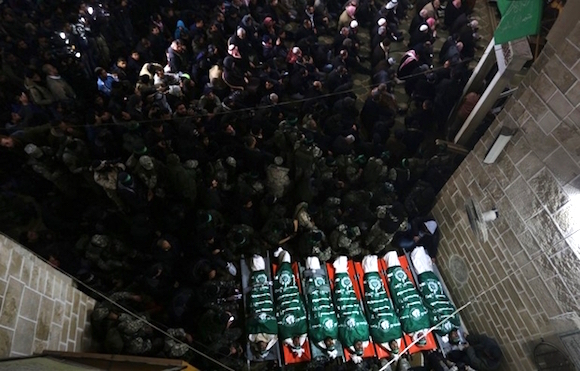 In Gaza, Hamas members were repairing a tunnel into Israel a few days ago when it collapsed and killed seven of them. These are the cross-border tunnels that Hamas terrorists use to enter Israel to commit murder or, better yet, try to kidnap Israeli soldiers. Thirty or more of these tunnels were destroyed by Israeli forces in the most recent conflict, and Hamas is now rebuilding them so they can renew their attacks on Israel. Informed of the death of one of the terrorists, his cousin said he was “happy and proud and welcomed the news of his death” because he “was martyred defending Islam and Palestine.” I am glad he is dead, too, but for different reasons. Terrorists are immensely popular in “Palestine,” and tens of thousands reportedly turned out to mourn the seven who died in the tunnel. There are heroes east of Gaza City, digging the rocks and building tunnels. And west of Gaza, heroes are testing rockets every morning and every day and it is all preparations. Under the ground and above the ground, in tunnels and above the ground and into the sky, with rockets and in the sea and everywhere, it is the permanent preparation for the sake of Jerusalem and Palestine, and for the sake of the intifada of Jerusalem and the sake of our people. I haven’t seen reports of any fatalities in the roof collapse.